K-State’s second road game of the season is Saturday as they prepare to take on #20 Oklahoma State in Stillwater. If you’re not headed down for the game, it’s time to throw a watch party for you and your friends. Here’s my tips for throwing a great watch party. Have plenty of beer and even more ice. It’s obvious that you need to have enough beer for the entire day, but I’ve seen parties be ruined by not having enough ice. No one wants a warm beer, my friends. Appropriate dress. I let it be known to my guests ahead of time that the appropriate attire for the event is purple and white. If you come to my watch party wearing anything too neutral, I’m inclined to make you change. And if you come to a watch party wearing blue or red, you’ll likely be kindly and repeatedly reminded of your hosts loyalties. Food. There are three essential food groups when throwing a tailgate; we’ve already covered one of them (beer). The other two essential food groups are meat and potatoes. I suggest brats, wings, burgers ( Hawk burgers are delightful), frankfurters, BBQ brisket or something of the sort to fulfill the meat category. For potatoes, chips will do. Of course no party is complete without the fourth food group, “sweets”. Cookies, brownies or other bake goods are a necessity and are always appreciated as a palate cleanser between your first course hamburger and the second course brats.. Plenty of TVs. There’s nothing worse than not being able to see the game. Have enough TVs in the watch area so that all can see without having to strain their necks. 50″+ TVs seem to work best. Establish ground rules. No one is allowed in the game viewing room unless they are 100% committed to the game. Anyone who would like to ‘chit chat’ is more than welcome:… welcome to come to my next party that isn’t a Watch Party that is. Keeping traditions. Playing the K-State fight song and Wabash Cannonball before the game is a great idea. Don’t forget the National Anthem in pre-game as well. Cheerleaders; a great way to keep your guests spirits high. An appearance by Willie Wildcat. Celebrity guests; perhaps Eric Stonestreet or President Schulz? A.K. 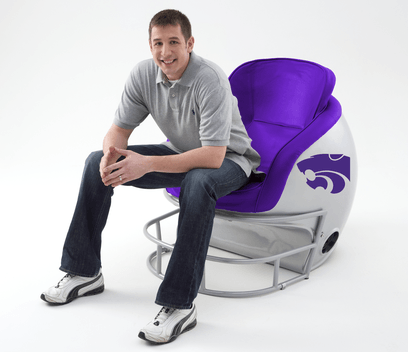 Statesman football helmet bar stools and chairs; true fan seating. Post game celebration. After the K-State victory, it’s important to have a celebratory beverage of your choice. Make it a good one! Follow these tips and your guests are sure to have a good time. Go Cats!